In 2008, Clyde began primary school at MOHI’s Joska center, where he excelled in his studies. In his eighth-grade year, Clyde earned a high score on Kenya’s national examination for secondary school. It enabled him to secure a spot at Starehe Boys’ Centre, a prestigious high school in Nairobi. 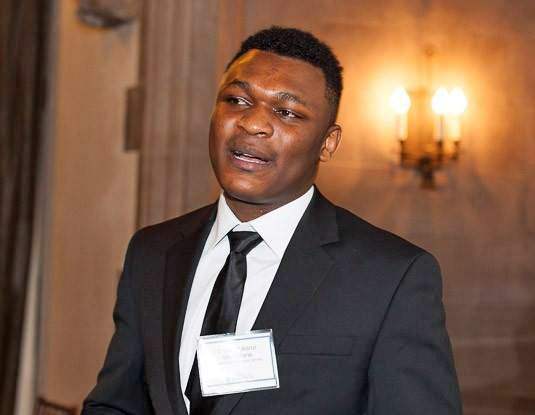 Clyde graduated from Starehe in 2013 and attended a local university while awaiting a decision on his application to the University of Toronto. In 2015, Clyde’s dream came true. Clyde received a full scholarship and he is studying economics and computer science. Clyde is the first MOHI student to study abroad at university. At Starehe, he met two friends who also desired to study internationally. The young men formed a club that they named “The Dreamers.” They began meeting regularly outside of school to discuss their aspirations of going to college, what they would study, and life after university. They helped each other complete college applications and edited each other’s essays. Most importantly, The Dreamers provided moral support to one another, pushing each other when things became difficult. The dream is now coming true for all three young men. Clyde is studying at University of Toronto. John is at Dartmouth University in New Hampshire studying computer science. The third member of The Dreamers is currently studying music at University of California-Berkeley. Clyde and his friends represent the aspirations of so many kids from Mathare Valley. Current students who have been taught through school that dreams can be achieved if you give your best. Future students who will learn to dream big and work toward those dreams. When they graduate from college, The Dreamers aspire to return to Kenya to help and inspire other dreamers like themselves from Mathare Valley. They’ve talked about starting an IT program to teach basic IT skills and software engineering or establishing a music production studio in Mathare to reach young people through music and show them the value of education. It all began with a dream of going to college. Now their dreams seem limitless and unstoppable.